Posted on September 1, 2016 by Barry V.
I end my day at Ipswich River Wildlife Sanctuary back at the visitor center, where a big spreading mulberry tree, with lots of ripening fruit, is attracting a parade of birds. 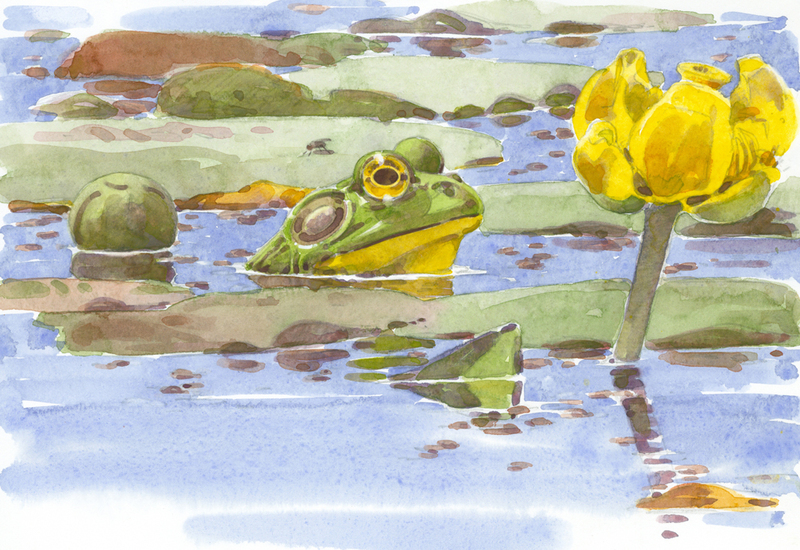 I meet Sandy Selesky, whose lovely photographs often grace the pages of BIRD OBSERVER magazine. We watch rose-breasted grosbeaks, cardinals, waxwings, red-bellied woodpeckers and robins gorging on the fruit. Nearby, a massive old white ash is attractive to birds that prefer an open perch. I get superb views of a wood pewee, than a handsome male bluebird. 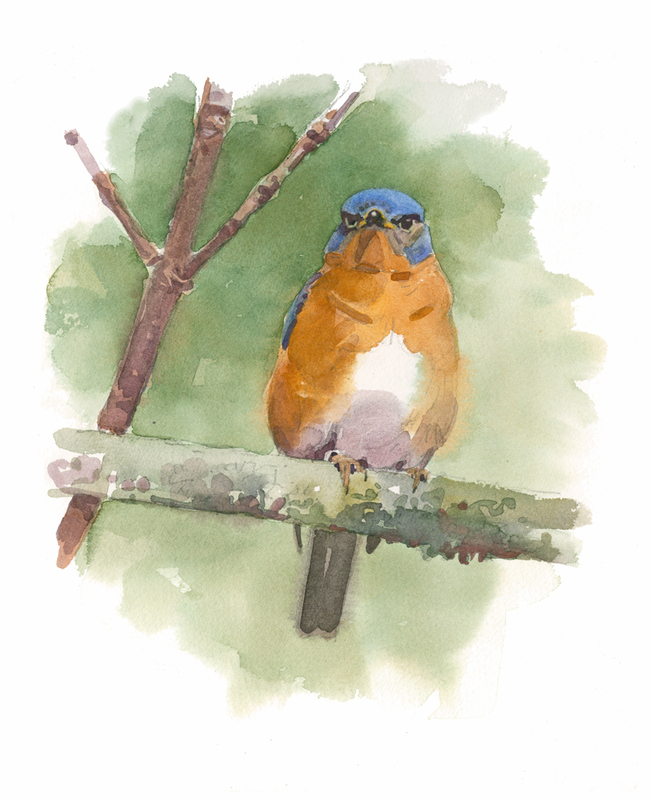 I start a drawing of the bluebird, and in the course of my work, notice a band on the bird’s right leg. The volunteers who monitor the nest boxes must know this bird well! 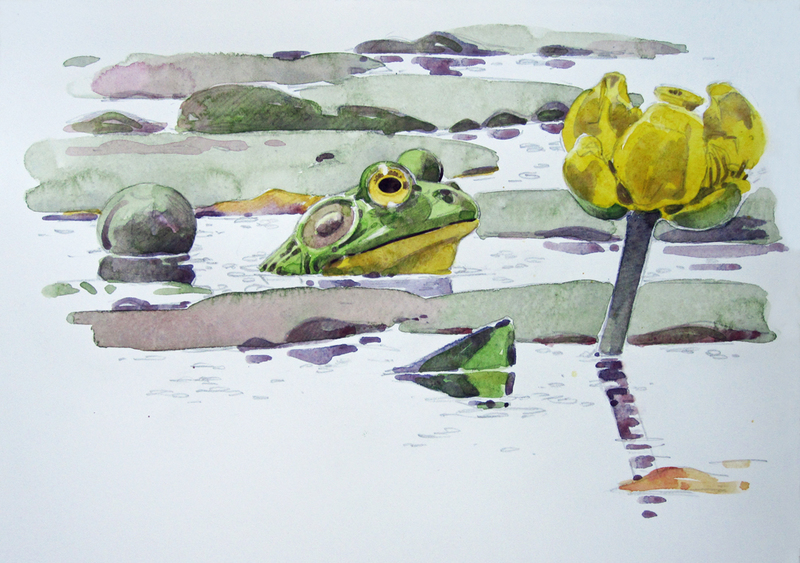 Remember the drawing of the Bullfrog and Spatterdock that I mentioned in my last post? 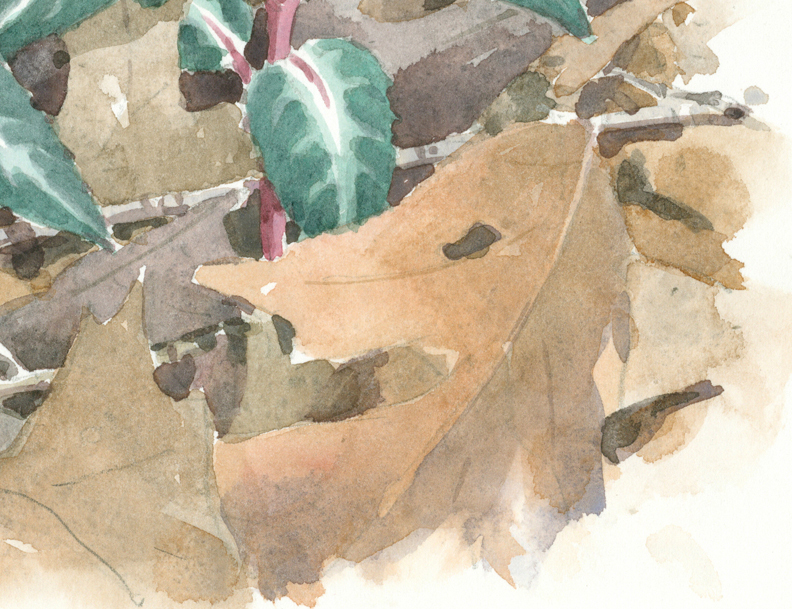 I often start a watercolor by mapping out the overall pattern of light and shade. Here, I used a neutral color mixed from ultramarine blue and vermilion. This mixture can be more bluish or more purplish by varying the proportion of the two pigments. 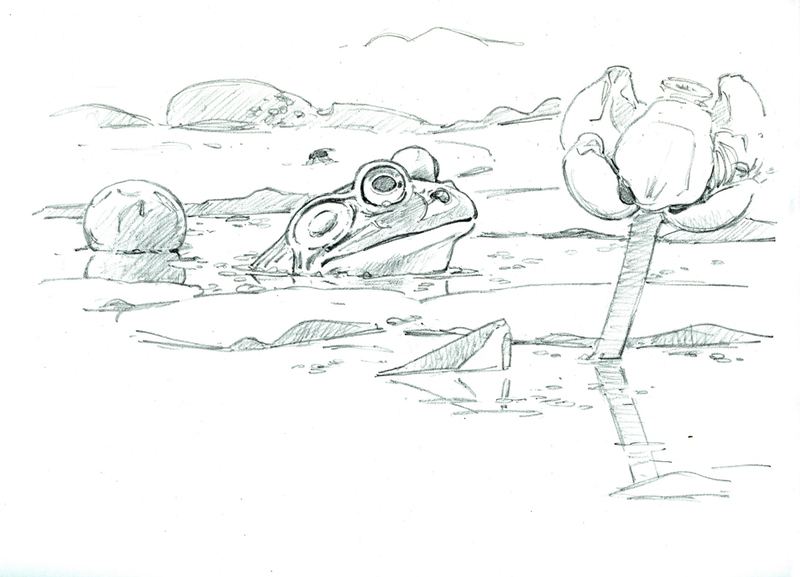 By starting the picture this way, I’m encouraged to work all over the picture, rather than focusing on any one part. It also forces me to consider the composition, especially the overall pattern of light and dark. I allow this step to dry completely. Next, I start to establish the local colors of the various elements, painting these colors right over my tonal washes from step 1 (in the vocabulary of watercolor, this is known as glazing). The final phase of the painting adds the rest of the local colors, and makes minor adjustments of tone and color to bring all parts of the picture into balance. 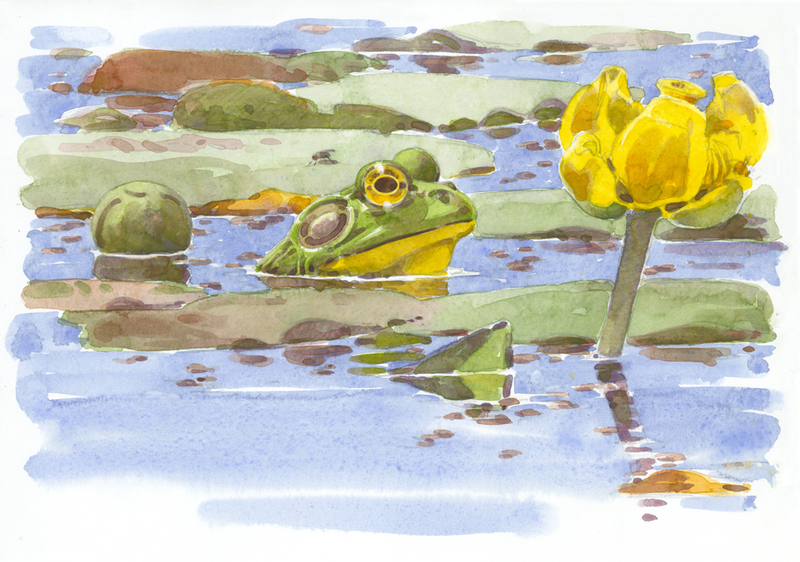 This entry was posted in Art Exhibition, Artists, Barry Van Dusen Residency, News and tagged bluebird, Frog, Ipswitch River Wildlife Sanctuary, watercolor technique on September 1, 2016 by Barry V..
Posted on January 25, 2016 by Barry V.
With two unseasonably mild days in the forecast, I head to Attleboro, MA, which is home to two Mass Audubon sanctuaries. The two properties are about a mile apart, and close to downtown Attleboro. Both are relatively recent additions to the Mass Audubon sanctuary system. Entering the woods along the Talaquega Trail, I notice rich patches of green on the forest floor. 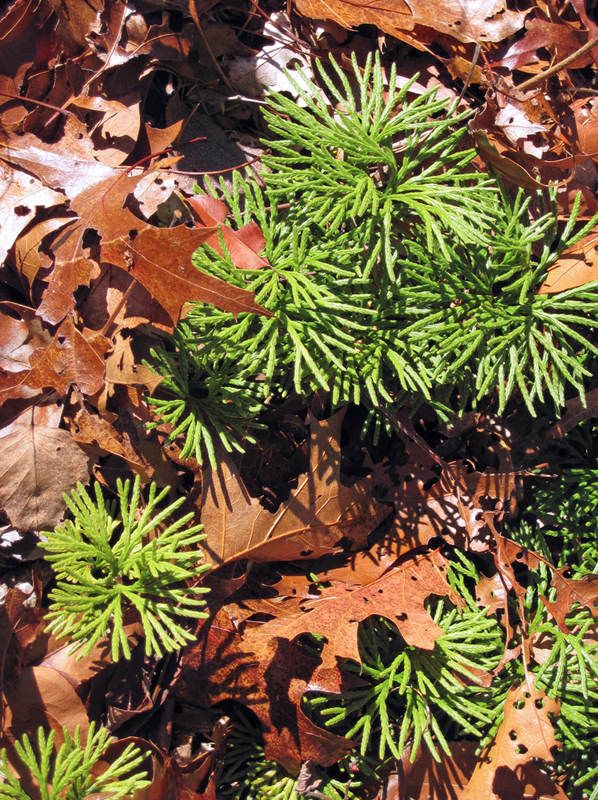 These are club mosses – tree clubmoss and ground cedar. On closer inspection, I find teaberry and striped pipsissewa intermixed with the clubmosses – a rich plant mosaic! The pipsissewa is especially distinctive, with its dark blue-green leaves veined in white. (technical note: the green of these leaves was achieved by mixing thalo green and ivory black – an unusual combination that captured just the right hue!). From each whorl of leaves, a tall spindly stalk rises and is topped with globular seed heads. Many of my students think of “backgrounds” as less important that the primary subject – a sort of space filler around the main attraction. But, as one of my college art teachers used to say: “There is NO unimportant part of a painting!”. Even ‘blank’ white spaces must be carefully considered, and must function as integral parts of the overall design. I often spend as much time designing and painting the “background” as I do the main subject, sometimes MORE, as in this case. 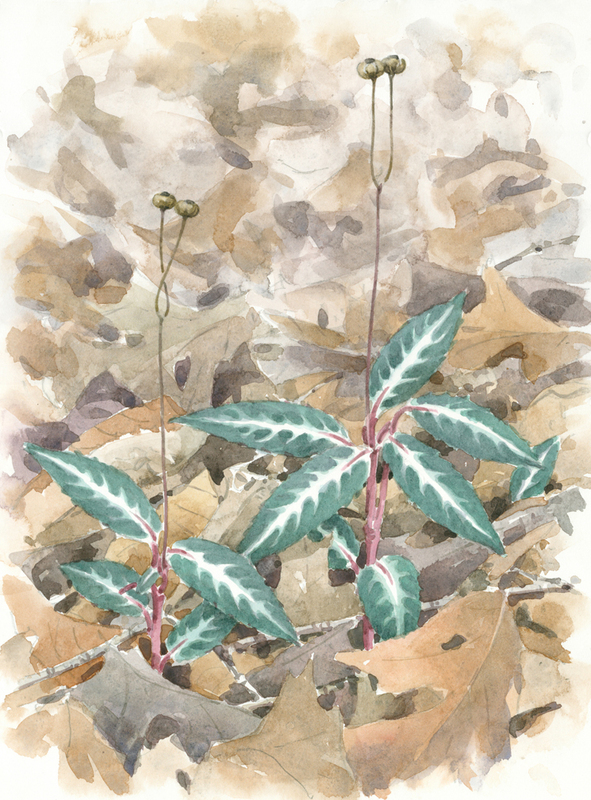 For this watercolor, I wanted to include a full background – the forest floor around the plant. 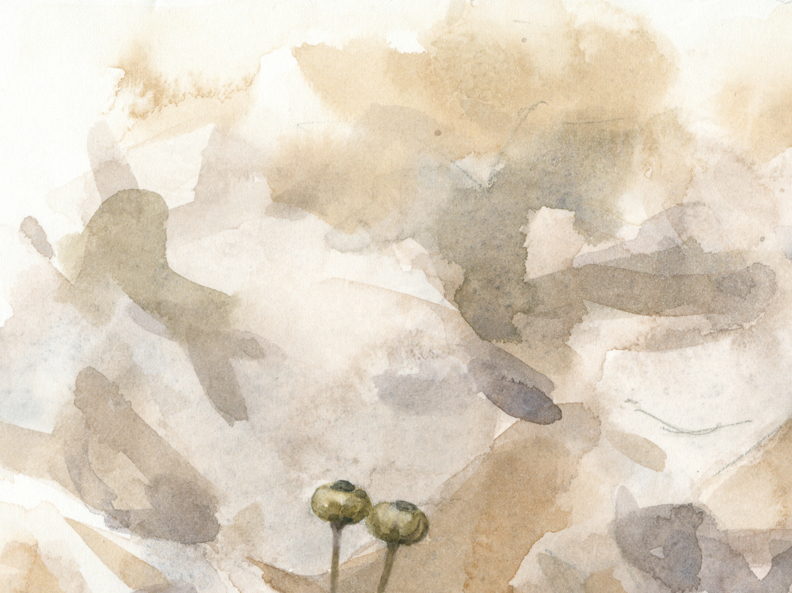 I also wanted those little cushion-like seed heads atop the slender stalks to be prominent in the upper portion of the picture (in life, they are often lost against the complex background pattern). I deliberately lightened the tones of the background at the top, and indicated the forest floor with an abstract arrangement of shapes and tones. The paler tones and softer edges, along with their position high in the picture, are all clues to the eye that there is greater depth in this part of the picture. At the bottom of the picture, the forest floor is much closer to our viewpoint, and it is rendered in distinct shapes – you can identify each leaf and twig, here. The trickiest part was the transition zone, where the background changes from representational to abstract. 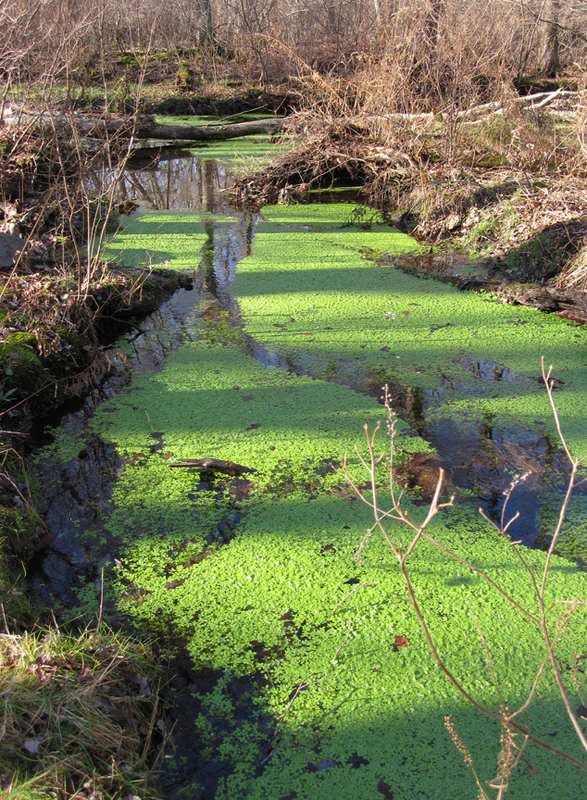 I find another strong note of ‘winter’s green’ in the cress-like plants growing in the stream that crosses the Talaquega Trail. I sent some pictures of this plant to friend and expert naturalist Joe Choiniere, and with some help from botanist Robert Bertin, we identified this plant as a species of Water-starwort (Callitriche sp.). 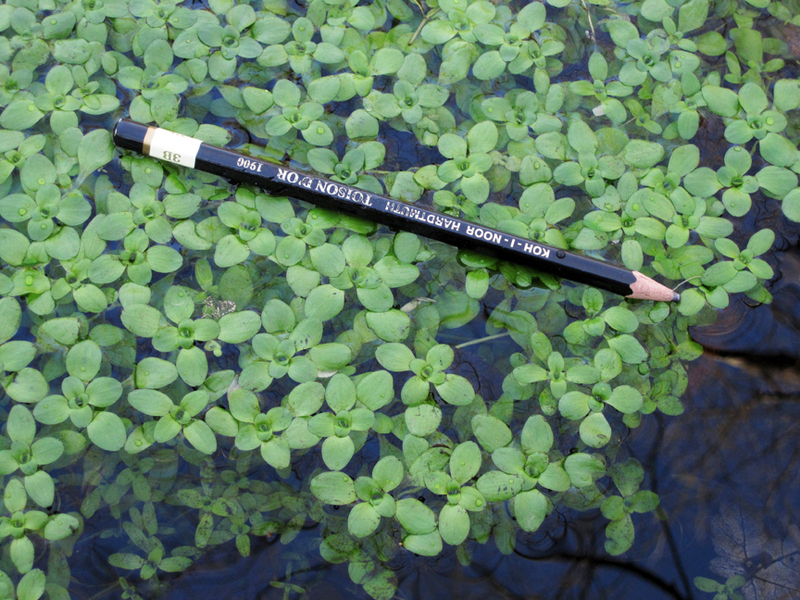 There are several native species of this aquatic plant, but identification can best be determined by examination of the flowers and fruits. Interestingly, the flowers can be pollinated either above or below the water’s surface! 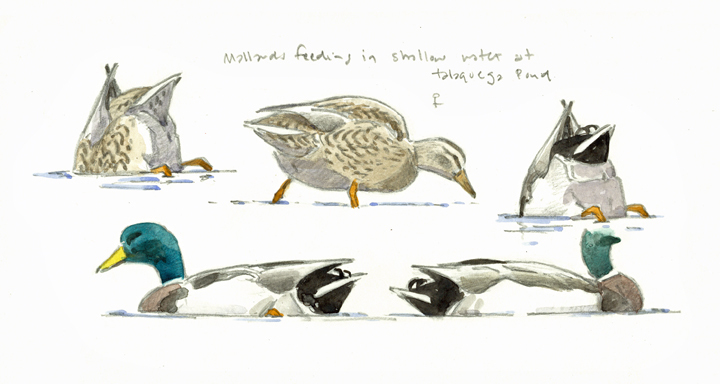 Talaquega Lake is quiet today, with just a few pairs of mallards feeding in the shallows. The lake is almost completely ice-free, with just a thin crust along the southern shore which will soon melt away in the afternoon sun. Scanning the pond with my telescope, I spot a single painted turtle hauled out onto the northeast shore, soaking up the rather weak rays of sun. A turtle sun-bathing in December! It has indeed been a mild winter so far. I pause along the trail on the northern side of the lake and study the colors of the opposite shore. 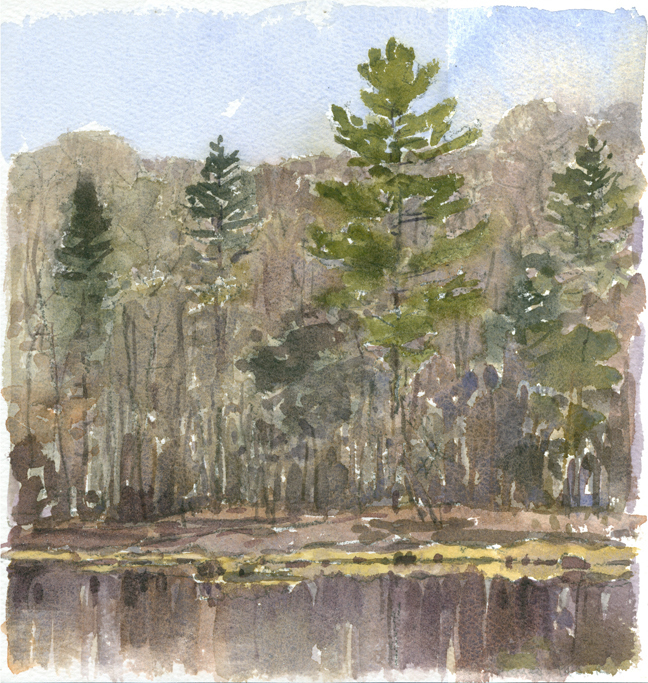 A big white pine dominates the view and supplies yet another note of ‘winter’s green’. 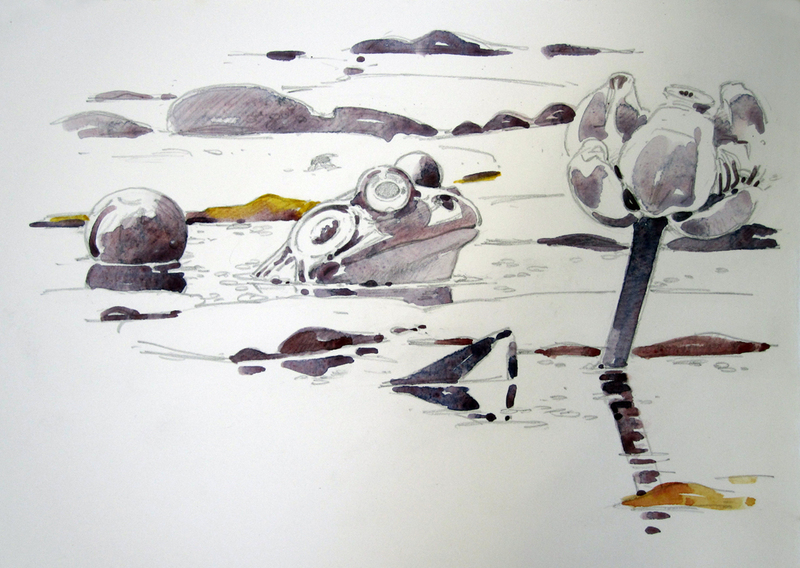 I set up my painting kit along the soggy shore, and do a small watercolor, allowing the subtle colors to melt into one another. This entry was posted in Art Exhibition, Artists, Barry Van Dusen Residency, News, Wildlife Sanctuary and tagged background, Barry Van Dusen, club mosses, cress-like plants, ground cedar, Landscape, Mallard, oak knoll, oak knoll attleboro, oak knoll wildlife sanctuary, Pepperbush, Robert Bertin, stream, striped pipsissewa, teaberry, texture, tree mosses, Water-starwort, watercolor technique on January 25, 2016 by Barry V..